Fishing Is Great! Catching Can Be A Little Off! Just finished up several days of WINDY conditions on the river. Wow! 30-40 mph wind gusts. It flat blows those drift boats off anchor. Overcast today with the high forecast to be 63 degrees. Going to have to go a little to make that. Thursday is looking great. High in the low 80s and lots of sunshine and light wind. Friday has a high in the 70s, maybe a shower in the morning, but light winds and cloudy. Weekend looks great. Upper 70s to low 80s and sunshine. Next week is looking like normal weather for this time of the year. mid 60s to upper 50s later in the week. Chance for showers is showing up on Tuesday. One or two generators running pretty low for two to three hours in the morning if they run anything in the morning. Then off most of the day and one or two units back on in the late afternoon for a couple hours and back off through the night. This has been the norm for the past several days. Dana on the water last Monday for the first of two days with Charles. Pretty good day for him stripping the pumpkin or blonde cracklebacks on a 1.5 ips sinking leader, and also caught a few stripping the tiger tail. Fish were hanging mainly in the shallower water. 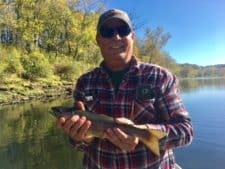 Marvin and Richard fished with Carolyn and they caught a few fish on the P&P midge or stripping a pumpkin crackleback. Stan’s guy, Gordon, from Alabama, was also stripping the pumpkin crackleback. This was one of those windy days and they were blown off anchor at least twice. Gordon enjoyed the windy day so much, he spent Tuesday back out on the water with Stan again. This day was even more WINDY! It was one of those 35-40 mph days. Hard to detect a strike due to the white caps on the water! Friday was a tiger tail day…..didn’t touch the crackleback. Wednesday, Charles spent another half day on the water with Dana. Not as good as Monday, but they caught fish again on the pumpkin crackleback. Stan and Carolyn had a group on the water for half a day. Carolyn took the ladies, Dawn and Ashley, and Stan took the guys, John and Richard. Understand whichever boat caught the most fish did not have to wash dishes while they were here. The ladies outfished the guys on the black copperhead midge. The guys were catching on the pumpkin crackleback. It was another one of those WINDY days and tough to stay in one place very long. Wednesday Jim spent a full day on the water with Gina. They stripped the tiger tail or JQ streamer and also caught some on the ruby 2.
midge or ruby 2. Gina had Dennis and Randy out for the morning. They were catching on the tiger tail or an olive bugger early in the day. Later it was a ruby 2 or P&P midge. Dennis likes dries and caught the best fish of the day on a size 14 Adams. Made his day. Randy likes stripping so he was fishing the tiger tail and bugger. Terry, from Oklahoma, fished with Stan on Saturday. They did not start until noon and it was one of the more difficult days Stan has had on the water. Not every very many opportunities to catch any as they were not biting that well. Fortunately, he did not get skunked. 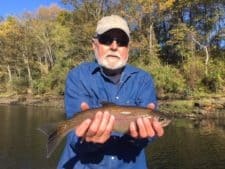 This entry was posted on Wednesday, November 1st, 2017 at 2:46 pm	and is filed under Fishing Reports. You can follow any responses to this entry through the RSS 2.0 feed. You can leave a response, or trackback from your own site.